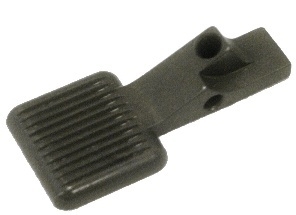 The Tactical Magazine Release Latch is manufactured to original USGI specification with the exception of the thumb pad which has been enlarged and serrated to provide a faster, smoother release, and a more positive grip. The case hardened steel has a hardness of 55 Rc and a Mil-Spec parkerized finish. The ergonomic design of the rounded edges assure comfortable use.